The Color Marketing Group International Summit is a World Color Forecast, comprising forecasts from Asia Pacific, Europe, North American, and Latin America. Each color is translated into NCS, Pantone, RAL, Munsell, LAB and sRGB color notations to facilitate color application across a wide number of materials and are invaluable tools to assist with the application of color to product lines. 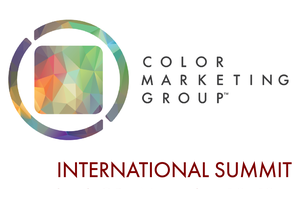 Color Forecasts with Notations are complimentary to those who attend the International Summit and CMG members. The Summit also provides workshops on directional color trends and the forces influencing color and design, the application of color to product, color combinations, finishes, and expressions, and there are also a myriad of educational sessions, and guest speakers.